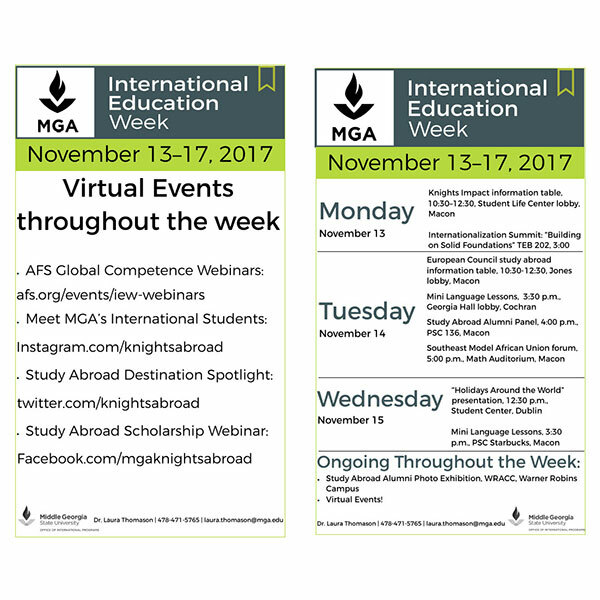 Middle Georgia State University will celebrate International Education Week 2017 with sessions on study abroad opportunities, mini language lessons, and a "Holidays Around the World" presentation for students, faculty, and staff. This year, the national observance is supplemented with a proclamation from Georgia Gov. Nathan Deal establishing International Education Week in Georgia and emphasizing the benefits of international programs for building intercultural competence and workforce readiness. Thomason said some of the planned activities are designed to help MGA students meet peers who have already studied abroad or participated in international service learning projects through the University's Knights Impact program. "Most students who have these experiences return home forever changed for the better," Thomason said. "They are our best sales force when it comes to encouraging other students to participate." For more information about MGA's International Programs, see www.mga.edu/international or contact Thomason at 478-471-5765 or laura.thomason@mga.edu.